8-9 for heavy or agressive expert skiers. Serious, strong twintip geared toward stronger, aggressive and/or heavier skiers who can abuse a ski in park or bumpy terrain. Not a fluffy park ski. This ski is capable of aggressive carving on groomed surfaces. Very nimble handling considering its burly construction and high-strength materials. Very controlled rebound and edgefeel with plenty of pop and security on-demand, but can also take a great deal of pressure and load without giving-way. This pair was mounted on-center for standard handling and tested with demo bindings so a forward-of-center mounting point was tested on several runs...making it very quick handling, but the standard mounting position was best all-around. The materials and construction of this ski indicate it will hold its high-performance personality for several seasons of hard use...a difficult task for many twintips to accomplish. High priced, but very high quality and performance. Kevan Beane has targeted the twintip of his lineup to hit the intended purpose very nicely. Kevan Beane, a transplanted hard-core skier, surfer from the U.S.A. (another American happily captured by a French woman and exported to France for marriage...there seems to be a pattern like this in other ski companies too [Peter from Rabbit On The Roof skis !]...) and former European ski derby competitor comes from a background of previously launching a European ski brand, helping launch "freeride" concepts for Salomon in the E.U., designing skis and producing action-lifestyle freeride sports film specials for Eurosport, MTV and various other media outlets through his "Worldride Productions" company. Having lived in Chamonix for more than ten years, base jumping, parasailing and skiing extreme terrain and big mountain competition, Kevan knows skis and high-performance riding. Rip'nWud skis are assembled by hand in France in a small workshop, which Kevan says will never produce more than 800 pairs per year maximum (to maintain quality and not go into "mass production"). Rip'nWud concentrates on custom production for special corporate events and promotion, outfitting olympic officials, chalet vacation outfitters, competition staffing and one-off custom designs for clients and derby competitors and has only decided to release "stock" models in 2010 for general sale to the public through the website and showroom near Geneva. Kevan prides himself with knowing his clients and supporting them after the sale, saying "no matter what concern the client has after purchasing my skis, I will make it right for them. My reputation is at stake here, and I want my customers to be absolutely happy and thrilled with their purchase and confidence in my products, now and for years to come." Proprietary, multi-laminate Swiss white ash wood core, triax fiberglass, proprietary dampening layer between base and core, proprietary running base (claimed to be "...between pTex 2000 and 4000") with special structuring for coarse-grain European snow conditions. ABS vertical sidewalls. Kevan has developed a proprietary lamination technique using Swiss white ash cores in which the behavior of the core can be "tuned" by carefully altering the lamination characteristics and density along the core's length and depth, producing a ski with, as Kevan states, "...remarkable torsional and longitudinal behavior tuned to each model's specified purpose, without adding weight or metal layers to get the control and feel I build into each ski...". Rip'nWud's philosophy is that simple, but highest quality white ash carefully laminated in proprietary and specific patterns, mixed with triax fiberglass and one or two "proprietary ingredients" produces a ski with superb flex behavior, vibration control and performance characteristics. Kevan hand-selects his specially-sourced white ash and maintains design and construction control throughout the process with his carefully trained specialists crafting the special vertical and horizontal core laminations to his specifications. As we have found in other skis, the quality of the ingredients does indeed make a difference in the final "feel" of the ski and its ability to retain its behavior over several seasons of usage. 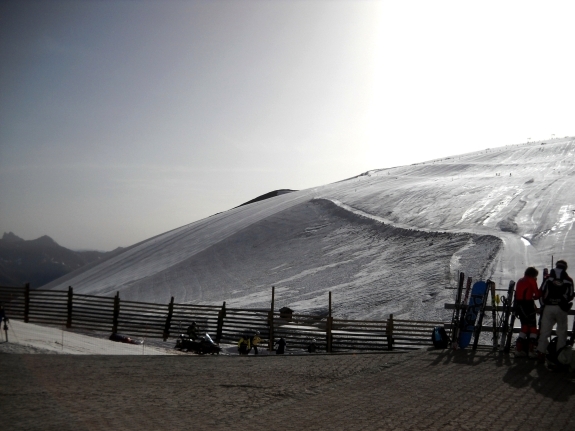 Given the same specifications and structural arrangements in construction, the ski with high-quality (i.e. 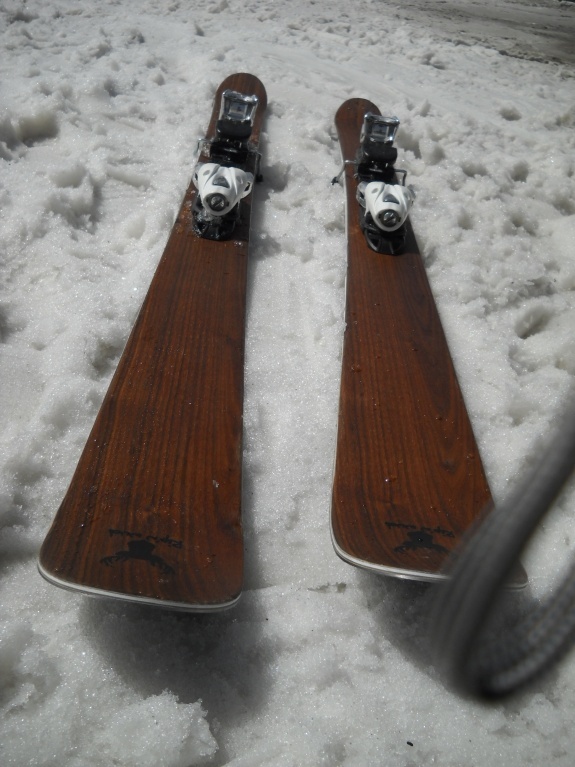 "expensive") materials behaves at a much higher level of performance than another ski having the same geometry built with lower-quality materials. The wood, fiberglass, resins, dampening layers, bases, topsheets and all ingredients simply perform better, longer and under harsher conditions than cheaper versions. Most new skis perform pretty well the first season, but the true test of quality comes after that first season. Kevan Beane aims to have his skis perform at their original level of behavior for many seasons, not just one, and thus builds his skis with the best materials he has found over many years of testing. Very clean, simple, handsome design using sandwich/sidewall construction, thin vertical profile from tip to tail showing very nice fit-and-finish. Excellent transluscent, non-stick topsheet sealing surface. Very nice quality North American black walnut topsheet grain on this model tested. Lightweigh for its size, with a strong even, progressive flex and moderate-to-strong rebound dampening response using "hand-gong" test. Strong and balanced rebound feel. Geometry appears gradual and progressive fore and aft. Very nice quality, but not polished to the kind of gloss finish you want white gloves to handle like some artisanal-finished skis. Impressively understated graphic appeal..."handsome", not "flashy". Nice, uniform black walnut topsheet. This ski immediately gives the impression of being very strong for a twintip, without being "burly." The turn responsiveness is very quick and always controlled with no odd behaviors in short or long carved turns or quick, poppy directional changes. Excellent rebound power when loaded and released, with top-of-the-line directional manners (no squirrely traits, even mounted on-center). Capable of sustained long-radius and cut-and-thrust short-radius turns at slow and high speeds, although at higher speeds, this ski can want to shoot out from under you when mounted on-center and it tells you it should be mounted back a bit for GS-style turns. I got the impression a lightweight skier or intermediate would become tired getting this ski to perform as it wants to for more than a couple hours. This is a strong, well-made ski with more strength than most twintips you see out there. It also geve me the impression the flex and rebound characteristics would remain pretty much as-is for several seasons of use without the loss of "zip" and responsiveness you often see in many of the massed-produced twintips on the market today. The Twin displays higher-than-expected edge grip on firmer surfaces and could be used all over the hill without any complaints. I am not a park-and-pipe skier, so park rats will have to try a demo for themselves to get a good idea of this ski's performance in a park-pounding environment. You get what you pay for. This model from Rip'NWud maintains Kevan's reputation for building high-quality, high-performance skis. Very handsome, clean look in the black walnut topsheet. Great twintip for heavier, stronger or aggressive skiers looking for highest-quality construction and materials to last several seasons without loosing its personality. 5' 11", 190 lbs. Expert groomed-surface carver, "old-style" race inspired, "foot steerer" with fairly sensitive edging feel. Loves to hold long arcs with lots of pressure on the downhill ski (you know the type), but also loves the feel of both skis on-edge leaving tiny railroad track edge tracks. Has a nasty habit of rotating the upper body...but working on it. Loves powder when it's not tracked out. 10 year coach for youth race team in New England (bulletproof is the norm).